Musiques Eclatees is also a short one day music festival. 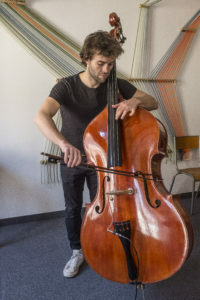 The second edition took place on 30th of March in 2019 in Strasbourg, France. 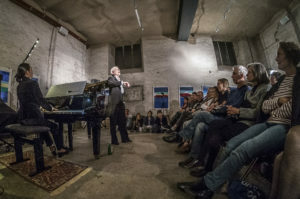 The audience was invited to discover a lot of musical styles and ensembles (contemporary music, classical music, jazz) through a truly journey composed by 10 concerts in 9 different venues. With more than 1 700 visitors during this day, this first edition of Musiques Eclatees was successful. You will find on this page the line-up and all artists of this second edition. PERTURBATION LOCOMOTIVE is a matter in continuous movement, whose inertia make to appear mistakes which will go little by little make it divert of its initial path. The machine started, it is rotate and speed up, the vibrations collide with each other in created interferences and beatings. The music slow the time down as it widens the space. 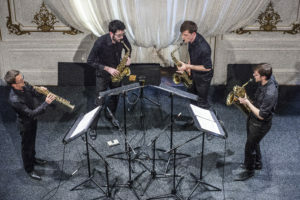 Roots4Clarinets is a clarinets quartet constituted in 2015 by four students of Music Academy in Strasbourg, guided by the desire to share a human and musical adventure. Since its creation, the quartet explores a huge musical horizon, mixing original pieces for this formation, and arrangements. Wealthy of this roots (Spain, Venezuela, France), Roots4Clarinets whishes to promote to audience music from different cultures. The band also committed to a strong approach to the interpretation of today’s music. 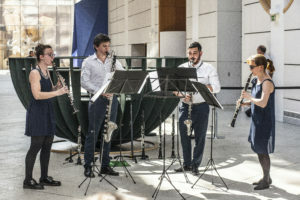 Attentive to share and transmission, they created in 2017 a clarinet and chamber music festival in Spain, which is a part of an approach teaching and artistic both, around music and clarinet, the passionate musicians. The hyperactive collective lovemusic and the pianist Christophe Imbs (electrified for the occasion! 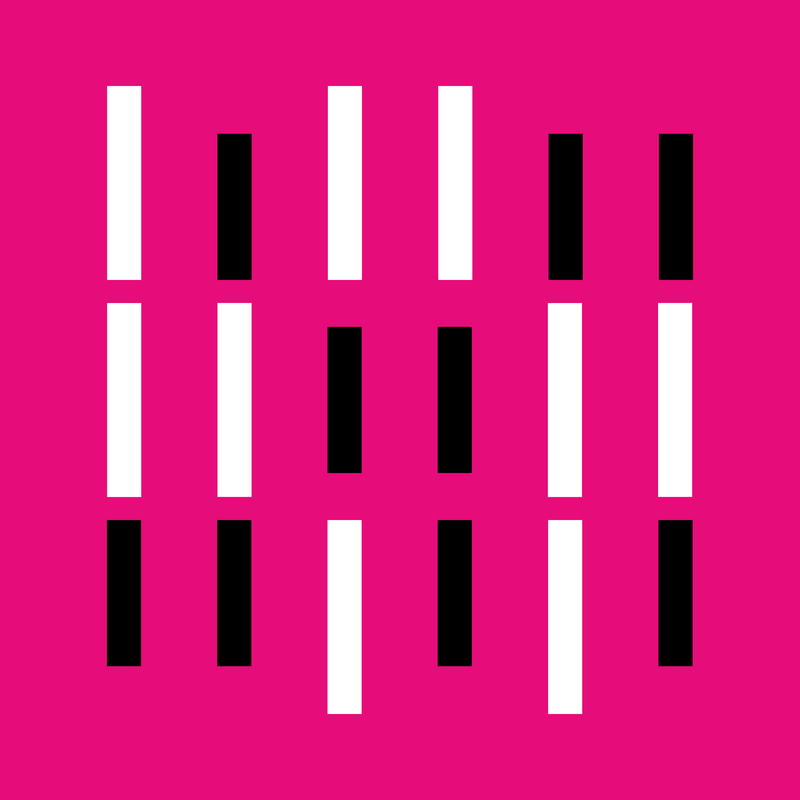 ), artists from different musical backgrounds, join forces for the first time for this sound research project. On top of the sound of a Fender Rhodes, pushed to it’s limits with effects, long hypnotic and melodic lines are constructed by flutes and clarinets. Electro / jazz influences mix seemlessly with the acoustic sounds of the two founding musicians of lovemusic, always eager to discover the interpretative possibilities of their instruments and to explore new creative collaborations by pushing the boundaries between musical genres. Premier of a new composition by Christophe Imbs written especially for Musiques Eclatees. 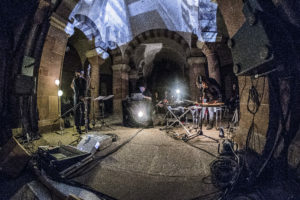 Between hypnotizing sounds landscapes and captivating instrumentals plans, the meeting of HANATSUmiroir duo and composer ErikM skim the Japanese mythology of Yokay (ghosts, monsters, bewitched). It is an amplified bass flute, objects of sound and electromagnetic lute-making sometimes luminous, interferences of powers and waves, all of this manipulated and reprocessed by the electronic device “Idiosyncrasie” of ErikM. The meeting happened on Drum-Machine created by the Strasbourg’s Percussions in 2016. The particular work of ErikM on the reformulation of instrumental gestures proposed by the artists and shaping again, his art of deconstruct and construct again in another way, the sound hierarchies of an overall sound, gave to the duo the desire to play with him. The creation made it in a long time, in order to apply, that he name, of dynamic composition. It is a sounds and instrumentals materials process that the artists give it to him in order to go well in its tessitura and its development in the time. This hybrid shape seems like a writing set : a more formal writing is here, for analogy, more a composition at the mixing desk. What more logical for an acousmatic music composer and an improviser frees to transpose his practice in an augmented instrumental version. Of this processes, born a practice more free where the performers earn in creativity, in link with musicals problematics of our time. Echoplasm is a mixt piece, which is nourish of a ghostly imaginary, inspired by tales and Yokai legendes. A Indian summer in October, flowers on trees in February and scorching temperature on August : there’s no more season my good lady ! What would Antonio Vivaldi think, for who seasons was gone like clockwork ? With a big generosity and a catching complicity, Voix de Stras’ consults the current issues in word and music. Their performance to Musiques Eclatees offer you their next creation at a preview showing : The four seasons… unleash. 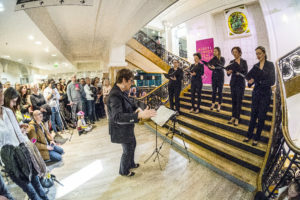 Voix de Stras’ performs to Chicago, Rio de Janeiro, Moscow, Vienna, but also Scharrachbergheim or Rocles, in concerts venues, museum, schools, companies or in the Human Rights Palace : all places where the voices can and have to make its hear. It’s sometimes like that a good story begin : going for a walk. So when two musicians of Ensemble de l’Ill take a hike, we travel with them all over the world. Other landscapes feed the hopes, loves and sorrows. The man, the woman and the child just as much sing there. It moves, it refocuses, too. 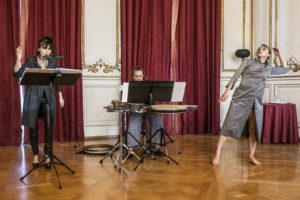 Ensemble of soloists formed around Françoise Kubler and Armand Angster, Accroche Note invests the repertoire of contemporary music. Every program decides of the personality and the number of musicians which constitute the ensemble. 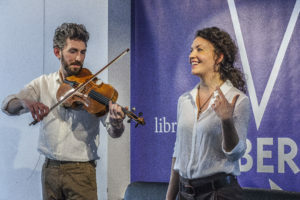 The flexibility of its number – as solo to chamber ensemble – allows it to approach with different projects, the historic pages, the instrumental and vocal literature of 20th century as well as contemporary and improvised music. For many years, the ensemble commissions new works in close collaboration with the composers. The ensemble is regularly invited in many national musical seasons, as well as in the major international festivals of contemporary music. The contemporary Argentina gets this roots in the diversity of popular music which are never stop to renew. From tango viejos to tango nuevos, each new generation of composers has known to get its inspiration in the work of the previous generations and in the plurality of identity which form the argentin population. RE/SONO pays tribute to argentine music in a contemporary program, with tangos tinted of french, italian, spanish and arab accents. In the form of contemporary argentine music exploration, RE/SONO presents an original program, with sonorities which play with the tradition in instilling the modernity, with roots from the past, and looking to the future. 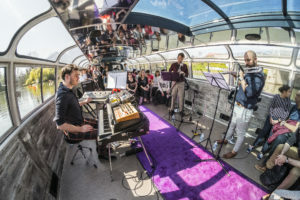 Mix of voice and piano, the Duo Absinthes invites you to a journey at the beginning of 20th century, between Paris and Berlin, in the ambivalent atmosphere of cabarets. At the day after the WW1, the Europe was born again of its ashes; a wind of freedom and anticonformism breezes on the youth. Paris and Berlin know a creative tumult renewed. All nightlife bunch rubs shoulders together, with drunkenness in this shady world. In Paris, composers like Milhaud are influenced by jazz; in Berlin this were Hollaender or Spoliansky who set in music, the lightness and emancipation while Weill, still engaged, reveals the darkness which hide this hedonism. Because the Europe dance on a volcano, and soon the boots sound will silence the sound of fox-trot. With elegance and mind, the Duo Absinthes draws the portrait of a multiple, modern, assert itself and eccentric femininity up. “When, in 1928, Maurice Martenot created for the first time the Ondes Martenot which its make him famous, he didn’t suspect that 80 years later, a little red-haired smuggler tried hard to cross the borders of his invention, synthesizer’s ancestor.” (Les Inrockuptibles). Christine Ott published three albums whose “Only Silence Remains”. Of classical training, soloist in operas and famous festivals, she has also rolled with Yann Tiersen, and has cooperated with Tindersticks, Radiohead or Jean-Philippe Goude. Light creator the day and musician by night, Mathieu Gabry works in the same way the “light” and the “sound”. 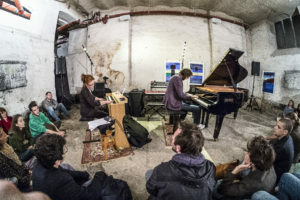 After their meeting in 2014, they formed together the duo SNOWDROPS in order to create movies’ and theater’ musics, and also immersive concerts with a visual dimension.